The Medical University- Sofia presented a documentary exhibition for the life of dr. Andrei Georgiev in the lobby of hall 2 in the National Palace of Culture. The exhibition was accomplished thanks to the efforts of the journalist from the newspaper Trud, Lubomir Yordanov and with the help from the Municipality of Lom the Mayor Mrs. Penka Penkova. She came especially for the occasion. According to the tradition, on the Day of the health worker, the academic society recognizes its success in research and teaching activity. 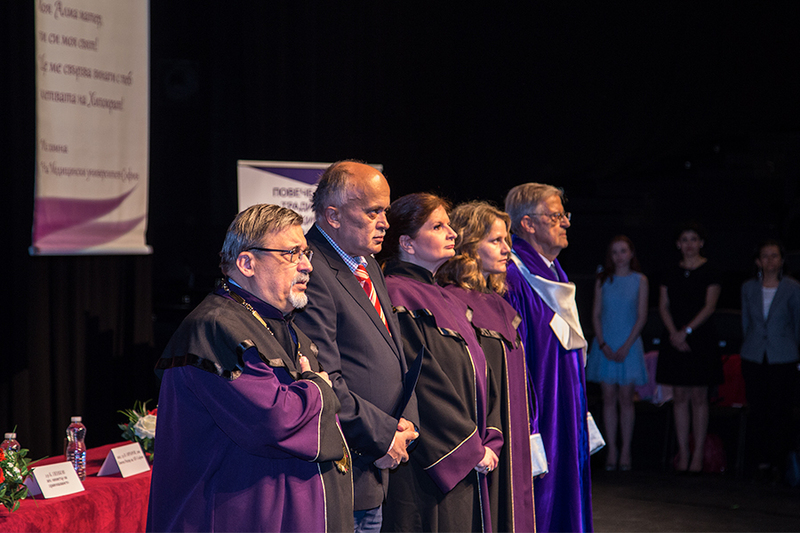 The official ceremony was held in hall 2 of the National Palace of the Culture, and guests was Deputy Minister of Health Dr. Boyko Penkov, the Honorary Rector of Sofia University Academician Prof. Vladimir Ovcharov, Deputy Rectors Prof. Valentina Petkova and Prof. Dr. Tihomira Zlatanova, the President of the Bulgarian Red Cross, Acad. Hristo Grigorov, the General Director of the Bulgarian Red Cross - Prof. Krasimir Gigov, President of the Bulgarian Pharmaceutical Union - Prof. Ilko Getov, the Mayor of Lom Municipality Mrs. Penka Penkova and others. "Best young driver of Bulgaria" is a campaign that is held for the 2dn year, in partnership with Sofia Municipality, Traffic Police and Bulgarian Red Cross. The campaign was hosted at the Preclinical Center at Medical Faculty- Sofia. The main goal is to make a priority, to drive safe on the road. More information you can find at www.youngdriver.bg . Due to celebration of the holiday of Medical University- Sofia, 5 of April, 2019 is holiday for the students and non-working day for teachers from all units. © 2019 Medical Faculty - Medical University - Sofia. All Rights Reserved.